More than three years after first proposed, “critical habitat” has been designated for Puget Sound steelhead, a prized fish whose population has declined drastically in the Puget Sound region. The new designation, announced last week, is the first time that critical habitat has ever been designated on the east side of the Kitsap Peninsula. Steelhead were listed as threatened under the Endangered Species Act in 2007, and this critical habitat designation is required under federal law to protect habitats — in this case streams — that are considered essential to the recovery of the species. Under the law, any federal actions that could affect critical habitat becomes subject to careful review to avoid degradation of the habitat. In most areas, this high-level review would apply to alteration of streams, wetlands or estuaries, or any construction covered by federal grants or permits — such as transportation projects. 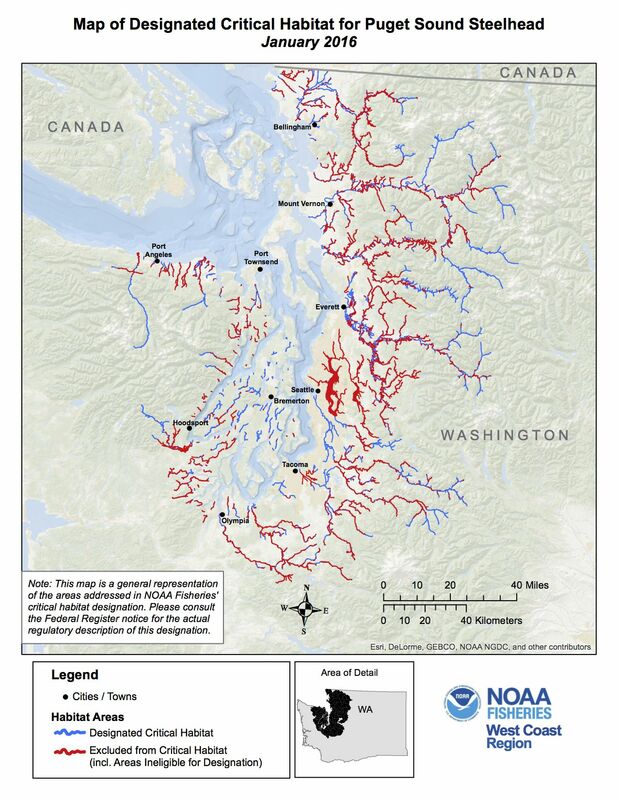 The National Oceanic and Atmospheric Administration has designated many Puget Sound streams as critical habitat for one or more listed species — such as Puget Sound chinook, Hood Canal summer chum or bull trout. But this is the first time the agency has provided federal protection for streams on the eastern side of the Kitsap Peninsula. Interestingly, the marine shoreline all around the peninsula has been designated as critical habitat for chinook. Although the numerous streams are considered too small to support chinook spawning, the shorelines are critically important for juvenile chinook, which must find places to feed, grow and escape predators on their migration to the ocean. The designation of East Kitsap as critical habitat for steelhead could bring increased scientific scrutiny to this area along with possible funding for the restoration of habitat, as I outlined in a Kitsap Sun story when the habitat was first proposed in 2013. See Kitsap Sun, Jan. 14, 2013, and Water Ways, March 15, 2013. Even though steelhead were listed as threatened eight years ago, knowledge remains sparse about the number of steelhead coming back to the Kitsap Peninsula or the habitat needs of the fish, local biologists tell me. Steelhead are stealthy fish, not easily found in the streams, although some information is being revealed by a handful of fish traps used by researchers to measure steelhead productivity. 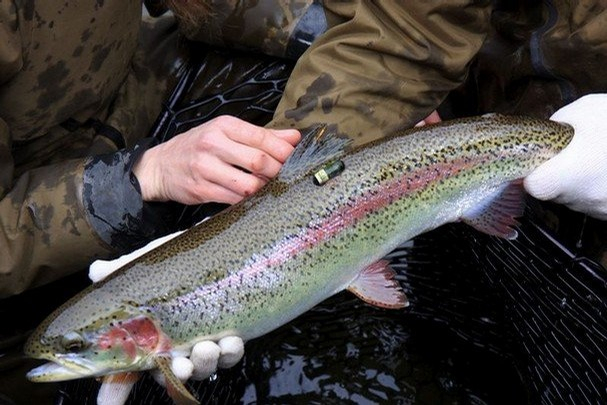 Acoustic tags help researchers track the movement of steelhead in Puget Sound. Steelhead can still be found in Kitsap streams, but in numbers far below what old-timers talk about. Many Kitsap streams have become “flashy,” meaning that streamflows rise and fall suddenly with the rains, because so much of the landscape has been paved or otherwise hardened. Those conditions limit the habitat, especially for fish like steelhead and coho, which make their way far upstream in Kitsap’s numerous little creeks. One difference between the two species is that coho die after spawning, while steelhead often head back to the ocean to spawn again on their next journey. As for the designation of critical habitat, the Suquamish Tribe was able to convince NOAA Fisheries to maintain closer jurisdiction over 90 miles of steelhead streams on the Kitsap Peninsula where they were originally proposed for exclusion from the designated critical habitat. In all, more than 2,000 miles of streams throughout the Puget Sound region were finally designated as critical habitat, but more than 1,500 miles of stream escaped the formal designation. That’s because the habitat was said to be protected in other ways or because the cost of protecting the habitat outweighed the benefits. The Lake Washington watershed was excluded under the cost-benefit rationale, but most of the excluded streams are on private and state forestlands managed under approved habitat conservation plans, which protect a variety of species. About 28 miles of streams on military bases were excluded because they fall under “integrated natural resource management plans.” About 70 miles of streams on tribal lands were excluded out of respect for tribal sovereignty and the role of the tribes in conservation. While many of the forestlands on the Kitsap Peninsula come under existing habitat conservations plans, the Suquamish Tribe argued that even greater oversight is needed. Streams subject to the HCP are not clearly delineated, nor are areas that would not be regulated by HCPs, the tribe argued. Kitsap County is undergoing urbanization, and these forests are threatened with conversion to residential and commercial development, the tribe said. NOAA Fisheries accepted the tribe’s point of view. In practice, the listing of Kitsap forests as critical habitat won’t have much effect, since forestland owners are already subject to state rules that are highly protective of stream habitat, said Adrian Miller, policy and environment manager for Pope Resources, the largest forestland owner in Kitsap County. Besides, Adrian told me, federal oversight only kicks in when there is a federal action — such as a new road or stream alteration, and these are rare on working forests. For Puget Sound, most areas designated as critical habitat are considered “occupied” by fish at this time. One exception is the Elwha River, where steelhead have been moving into areas not occupied by anadromous fish since the Elwha Dam was built in 1910. Since removal of the Elwha Dam and the Glines Canyon Dam upstream, biologists have not fully documented the full extent of the habitat used by steelhead. Since much of the upstream habitat is within Olympic National Park, I’m not sure the habitat needs special protection under the Endangered Species Act. But it is nice to know that steelhead habitat in the Elwha is protected at the highest level and just waiting for steelhead to arrive. For information, see the formal listing of Puget Sound steelhead habitat in the Federal Register. Other documents about habitat can be found on NOAA Fisheries website. NOAA continues to work toward a recovery plan for Puget Sound steelhead. Documents can be found on NOAA’s website about steelhead recovery. Washington Department of Fish and Wildlife has issued reports on Puget Sound steelhead populations. Two weeks ago, five conservation groups filed a lawsuit against NOAA Fisheries for not completing the recovery plan within a reasonable time. See Wild Fish Conservancy news release, which includes a link to the legal documents.